Do you think the time span for an individual changes depending on their passion for the task they are working on? I observe some employees who seem to have a hard time effectively planning some specific shorter time span tasks (1-2 weeks out), while at the same time they are able to effectively plan out personal “work” over a year in advance. I have observed this with more than one employee and was curious if you had contemplated this or come across research related to this. There is a distinct difference between maximum capability and applied capability. Maximum capability is the stuff that we, as managers, cannot see…but it’s there. The team member has the necessary skills (technical knowledge and practiced performance). The team member has interest or passion for the work. The task or behavior is consistent within the context (culture) of the work environment. So, it’s that second condition you are asking about. Interest or passion drives focus, attention and duration. Applied capability (what you see) gets pushed further out whenever there is interest around the work. So, what you are seeing is an attitude (lack of interest) related to shorter term tasks. Your role, as a manager, is to tie things together, make the connection between interest and the task. Sometimes it is not intrinsic interest, but connected interest. I may not have interest in the project, but certainly have interest in the reward of the project that allows my to purchase the boat (home, car, lifestyle) of my dreams. Connect the work with interest, you will see higher applied capability. But, here is the hat trick (three goals in a single game). Intrinsic reward comes from challenging work. Any work. Successful completion of challenging work creates endorphins in the brain. There is some work that is simply not challenging, yet has to be done. It is likely that work is a candidate for delegation. You are the manager. What is your role in accurately assigning challenging work and coaching people through work they should delegate to other team members? 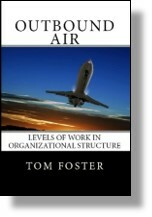 This entry was posted in Accountability, Coaching Skills, Time Span and tagged applied capability, challenging work, interest in the work, maximum capability, timespan on March 27, 2019 by Tom Foster. I attended one of your workshops last week. How do you evaluate the Potential Capability of prospective or current employees, using Time Span as the metric? While this sounds like a simple question, there are many elements to it. Your question is all about Capability. Does this person have the Capability to fill the role, now? Does this person have the Potential Capability to fill this role in one or two years? Is the underperformance, that I observe, related to a lack of Capability, OR another factor? These are all absolutely legitimate questions for a manager to ask when making a decision related to task assignment, internal promotion and external recruiting from a candidate pool. And I depend on the judgment of the manager to determine which factor(s) are most directly related to the performance I observe. And if the primary factor turns out to be Capability, the most descriptive term is Applied Capability. Indeed, the person may have greater Potential Capability, but as a manager, I am only able to see Applied Capability. I can see Applied Capability because there is a work product, direct output. But your question was about Potential Capability. As a manager, I may make an intuitive judgment that a team member has greater Potential. This typically means, that, as a manager, I observe underperformance that I deem “could be better.” The question is “why?” What factors could be changed to create higher levels of effectiveness in the role (or task)? Changing the degree of Applied Capability has little to do with Capability. It has more to do with the other three factors. The limits to Applied Capability have to do with Skill, Interest and Reasonable Behavior. Change any one of those factors and you will see a change in Applied Capability. Our next online program Hiring Talent kicks off Mar 19, 2012. Pre-register now. This entry was posted in Time Span and tagged accountability, applied capability, capability, interest, maximum capability, passion, performance, time span, value for the work on March 13, 2012 by Tom Foster. How can I tell? You talked about the four states of mental processing. When I look at a person, meet a person, talk to a person, how can I tell? How can I tell if they have Stratum I, II, III or IV capability? The short answer is, you can’t tell. The longer answer is, it’s not your place to determine capability. Leave that to a higher authority. Look, you are a manager. You are not an amateur psychologist. Can you spot positive behavior from your team members? Can you spot negative behavior? Why does it only take nanoseconds for you to tell the difference? Because you are a manager, that’s what managers do. Play to your strengths as a manager. Is it within your authority as a manager to determine what tasks need to be completed? Is it within your authority as a manager to determine a reasonable amount of time for each task? Is it within your authority as a manager to evaluate the effectiveness of the person you have assigned to each task? That is your playing field. It is within your authority to evaluate the effectiveness of your team members related to the task. There are a handful of factors that contribute to or detract from effectiveness – skills, circumstances, interest, habits. Stay on this playing field, that’s what you are good at. The question of a person’s maximum capability is not your issue. Your issue, as a manager, is ONLY what is capability related to the task. It’s all about the work. This entry was posted in Time Span and tagged effectiveness skills, maximum capability, negative behavior, stratum on February 13, 2012 by Tom Foster.